Free off road parking is available behind St Mary's Church. Ticket includes tea/coffee, scone, jam & cream. Please note: booking for this event is by phone only at QUAD on 01332 290606. Booking deadline is Friday 24 May. In her new book, The Apprehensive Gardener published by Pimpernel Press in May 2019, Griselda Kerr has written a practical guide on how, what and when to look at the plants growing in the garden. With over 700 plants to refer to, it includes almost all plants likely to be found in a non-specialist UK garden. Look up the plant in a specially formatted index spread across the year and a page reference will take you to a short, clearly written entry on what to do in a particular month. The book took 20 years of gathering gardening knowledge (and testing much of it out in her garden) so that now she has the book she wished she had had access to when, with no gardening experience, she started to revive ‘the dismal looking plants in her garden’. No coffee table book this, it is made for constant quick reference, to be used as you might take a knowledgeable friend into your garden to give you advice on specific plants. Griselda explains what to do to each plant – whether to clip, deadhead or divide, cut right down, feed, mulch or leave well alone. Each of these gardening techniques is also explained in a comprehensive glossary. It is an invaluable guide to plant care for the beginner gardener or for more experienced gardeners wanting guidance on specific plants. 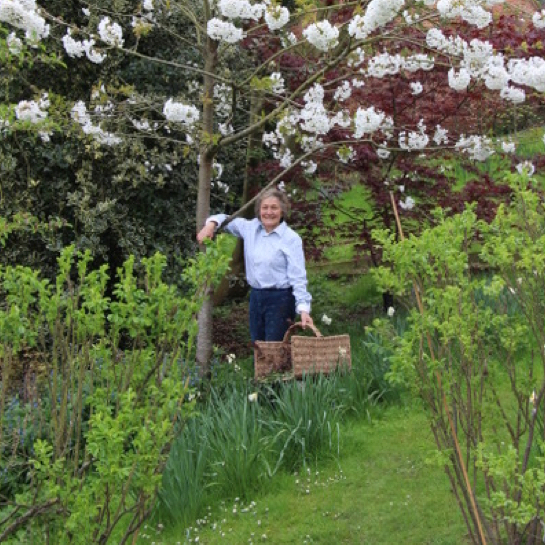 Griselda, with Susie Pasley-Tyler owner and gardener of Coton Manor in Northamptonshire – a garden Griselda greatly admires ‘for sheer gardening brilliance’, - will talk about why and how the book came about and what challenges it presented. There will be an opportunity to have a guided tour of Pugin’s St Mary’s Church after the event.